I am a wood geek. I love the living cells of trees and the hundreds of compounds that produce the various aromatics, tannins and flavors that make trees so valuable for medicinal, cosmetic, and flavoring uses. Whenever I’m in the woods, I always feel like these giants are breathing with me. Then my joyful thoughts turn sad. Observing over the years how our lifestyle and explorative ways have changed our atmosphere which in turn changes the natural order of things. One of those things is our trees. But North America is not alone! Battles over the loss of various hardwoods and softwoods continue as we fight to save the forest giants as well as orchard soldiers around the globe. It’s called Xylella fastidiosa and it’s a deadly bacterium that is gaining attention as it takes mark on the olive trees and groves of Italy since 2013. 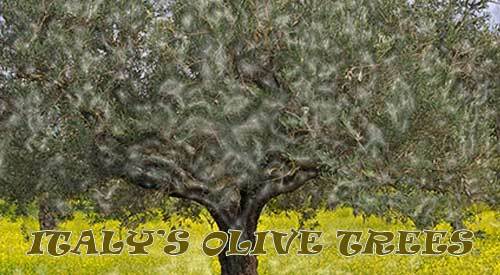 In 2016, this bacterium was blamed for the death of some one million olive trees in Southern Italy most of which were cut down to stop the deadly bacterium from spreading. But it hasn’t stopped. Even with netting and routine pruning, olive trees continue to suffer and eventually die or are cut down. We know that the bacterium starts somewhere within the heart of the tree and then travels towards the roots and branches. This is the reason pruning can sometimes be beneficial. Research has also shown that there are specific varieties of olive trees that are more susceptible to Xylella resulting in growers moving toward varieties with less risk when they replace or add new growth areas. There is a pest, the meadow spittlebug, that is the carrier of Xylella and the reason it is necessary to net the trees to prevent this pest from traveling and spreading this major bacterium concern to other areas and other countries. Much like our North American Emerald Ash Borer pest that is responsible for tens of millions of ash tree death and destruction, the meadow spittlebug and the Xylella bacterium it can carry results in loss of olive production to those damaged branches. Although the olive oil pressed from the olives research shows does not carry any disease or risk, the bacterium has significantly reduced the volume of olives available to produce oil. Thus, pricing goes up as availability of olives depletes. You might think this is just an olive tree issue but you’d be deadly wrong. Xylella is a strain of bacterium that is considered one of the most dangerous plant bacteria in the world. It causes a tree to die of thirst from the inside out by blocking the xylem or transport tissue of the tree responsible for moving water and nutrients from the roots upwards to other parts of the tree. Xylella is then carried from tree to tree by the spittlebug who latch on to the tree’s xylem tubes sucking out liquid. When they travel to the next tree to feed, the bacterium they’ve picked up is passed into that tree’s xylem when they go to feed again. With no cure, the plant or tree stays infected for life, until it dies. There have been strains of Xylella fastidiosa in citrus as well as pear, peach and plum. There is also a potential new strain in Southern California that could affect the grape production which could decimate the wine production something not needed after all the years of wildfires. Continents currently affected by this bacterium include North America, Europe, and Asia but more are expected. In my opinion, the focused concern is on the specific market of product whether it be olive oil, wine, or fruits and not on the tree destruction that is occurring all around us. I’m wondering how much longer we have to witness century old trees dying and family businesses evaporating from what appears to be nature taking back or returning to the soil what she feels is rightly hers. I can’t help but think that these pests that are invading our largest plants on our planet are likely the result of our own actions or even inaction. How concerned are you about the North American trees? Leave us a comment and subscribe to get our latest tips, techniques, and recipes, plus, the science behind the fire and smoke. -I’LL TAKE MINE WITH AN OLIVE! -IS THE FOOD INDUSTRY CULPABLE FOR THE SPREAD OF OAK TREE MORTALITY? Dr. Smoke- protect our tree resources. We are so lucky to have so many options for cooking our foods, not to mention the option to not cook at all! This got me thinking about the fact that we do rely on our outdoor equipment and cookware when it comes to outdoor cooking. Even if you’re a person who has experience campfire cooking, you likely do this style of cooking with one type of fire setup . Let’s look at some of the options for setting up an outdoor fire that don’t include purchased equipment, just the natural elements found outdoors – rock, tinder, kindling, and logs/wood. As I always like to remind you, though you may not use this information immediately, you should read it and keep a reference handy for when a situation may arise that you need it, such as a natural disaster, power grid emergency or other such catastrophic event. One of the best reasons for learning this type of fire set up is it works particularly well in windy conditions. The key is to dig a trench that is large enough to acquire oxygen to keep it going. Best sizing is 12 inches wide by 36 inches long by 12 inches deep. Find rocks to add to the bottom of the trench that are hard and porous-free. Be sure the 12-inch depth is AFTER the rocks are added. Now build your fire on top of the rocks. You can secure tree branches to act as postings for supporting a spit or layer green branches (not dried branches) over the top of the pit for placing your foods. Of course, if you have a grill grate, place over the hole for direct grilling. The Dakota Fire Hole measure 12-inches deep by 12-inches wide with a channel that is 6-inches wide off to one side of the main fire area. There should be a 12-inch space between the chimney opening and the channel. The channel is dug at an angle meeting at the base of the fire pit area 12-inches down. Build a fire at the base of the chimney area which draws air in from the side channel producing a draft for outtake at the top of the fire pit. This is another cooking method that burns wood efficiently and produces very little smoke. 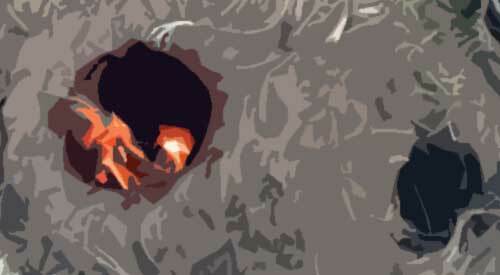 Plus, if you should need to keep yourself concealed, no one can see the glow of the burning fire because it is concealed underground. This is an ideal fire setup when you know you can remain in a specified area for a longer time period. It is perfect for sustaining a fire for days as it includes flat rocks for cooking on, a rock surround for maintaining a safe fire area, and a keyhole channel made of rock that allows you to place larger logs for continuous burn. This produces a great bed of coals for cooking and if made against a rock barrier or tree stump, it can also provide the heat output necessary to keep you warm. 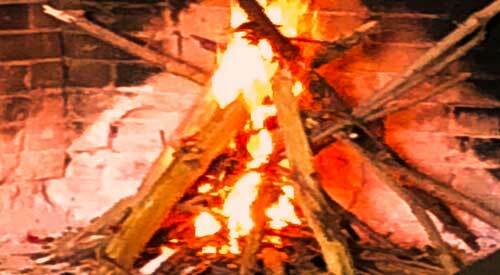 Plus, you can simply push the long log pieces into the fire circle when additional wood is need for heat and/or coals. No need to keep splitting wood. This is a familiar fire set up in the camping world. It is easy to do as you simply alternate pieces of wood from vertical positioning to horizontal, like building a Lincoln Log set, with tinder and kindling placed inside the base. This is a setup that produces a great bed of coals so it is perfect for cooking but depending on the amount of time you need for cooking, may require replenishment of wood. This setup is essentially a log cabin style setup in reverse. Instead of tinder placed under the base of the logs, it is placed on top. This is also known as a top-down fire. Although you can use this for cooking, I’ve found it doesn’t produce the best coal bed. It does, however, burn a long time. 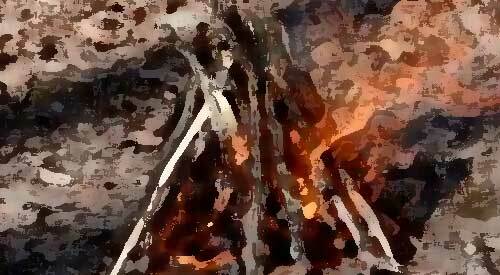 The Star Fire: Although this can produce a very long burn, because of the extension of longer pieces of log in a star-shape to the center of the fire, a true cooking coal bed is not formed, just a lot of ash. As a final reminder when it comes to cooking by outdoor fire, you are not cooking with flame or for that matter, direct heat. Use the hot coals that are produced from the fire to cook with. That includes placing heat tolerant cookware on or in the hot coals, or even burying within the coals. 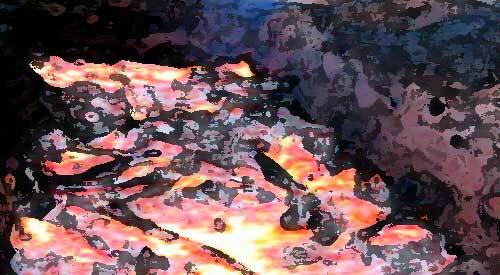 The rocks are an energy absorber, producing a lot of heat. Clean, large rocks can be used like a griddle surface and have foods cooked directly on their surface. Remember, they get very hot so any unclean quality to them will be burned off with the heat. A final note, always have fire proof gloves available to grab log pieces in the fire or cookware placement and removal. A coal shovel is ideal as well for moving hot coals around. Don’t forget, when you’re finished with the fire you made, ensure that all hot embers and coals are extinguished. Do you have a favorite method of stacking wood for a cooking fire? Leave us a comment to let us know. We welcome all types of questions and encourage you to follow and subscribe to our social channels so you don’t miss anything. We look forward to providing you with additional tips, techniques, recipes, and the science for all things wood-fired cooked. The simple campfire provides more uses beyond just fire cooking! You’ve likely heard this phrase before whether as a child, adult or at intervals of both. “Fire is meant to be respected.” I’m going to go one step further. Fire should not only be respected, it should be honored and appreciated for all it can offer. I’m going to point out to you just what other uses fire can present to you. Perhaps next time you light a fire whether in your charcoal chimney starter, charcoal grill, fireplace, or even outdoor fire pit, you’ll give some pause to the other uses to keep in your knowledge arsenal for times you may need this information. As I age, I am always in tune with my environment and how I can use it to survive if a situation I can’t control should call for it. If you are fortunate as I am to have an outdoor source of fire other than your traditional grill, then you’ve likely found yourself enjoying this first benefit of fire. Heat. But you likely don’t know about the radiant heat quality of fire. With a single fire, only the surfaces facing it are warmed. When it comes to surviving outdoors with heat from a fire, this is when you will want to learn about reflective ability of the fire. If you have a choice in fire building location when you need it for survival, elect to build one near a large rock or tree stump but add a reflector component on the other side of the fire. This will allow the rock or tree stump to absorb the heat from the fire and then reflect it back. By adding a reflector on the other side of the fire, you will enjoy heat both on your back and front, the ideal for surviving if you must rely on fire for body temperature. Plus, the two reflecting points will force the smoke to go upward allowing you to avoid smoke in the eyes. We all know that fire makes smoke and that smoke acts as a signal. When you want to be found, this is the perfect means for attracting attention. What you need to know is that the terrain plays a part in being seen. If you want to use smoke to signal for help, then seek high points for making one. If you are in a dire situation where you’ve been unable to bring many supplies with you, know that fire can aid your ability to stay alive. You can only survive 3 days without water so finding water is a priority. You can sterilize water found from any source for consumption by boiling it which is a temperature of 212°F. Essentially, 1 liter of water per person will get you through survival of 3-4 days. We tend to rely on someone else in the food production chain to preserve food but you may find a time where you either want to do this for your own family or you have to. Drying, smoking, pickling, and salting are methods of preserving foods from micro-organisms that spoil food. When you smoke meat you dehydrate it and produce a protective coating on the outside that prevents bacteria and condensation from penetrating. This is a means of ensuring you have a food supply that can keep you alive for quite a long time. If you’ve ever been camping or glamping in a forest area, then you know that you are never alone. Wildlife dominates in these areas. Fire can be a protector when it comes to keeping these visitors at bay. Always be sure to have a portable fire set up such as a rag tied to the end of stick or similar tool to use as a portable weapon should a forest resident elect to come close to you. Do you have another survival use for fire? Leave us a comment to share your views. Bringing you informative recipes, techniques, and the science beyond the fire, smoke, and flavor. That’s SmokinLicious®! 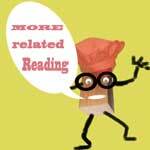 More related reading on fire cooking, smoking & Grilling tips and technique see our directory on previous blogs! 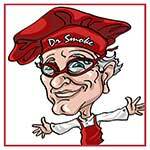 Dr. Smoke- fire cooking and beyond! Let me start this article by first reminding you that wood contains hundreds of compounds that honestly, we don’t know everything about. For this reason, I am only speaking today regarding those known compounds and what they contribute to foods cooked by wood fire. Specifically, I’ll be looking at lignin which is the only large-scale biomass source that has aromatic functionality. In English, this is what gives wood-fired foods the distinct flavor and aroma. Often, you read about specific flavors and aromas as they apply to meats but today, I want to delve into the compounds that are most prevalent by wood species and what they offer to food. Lignin is one of the primary compounds responsible for cell construction in a tree and makes up 15-30% of wood cells. It has a primary role in conducting water to feed the tree’s cells and when burned, yields a tremendous amount of energy. Plus, lignin produces rigidity in cell walls which prevents rot. As a polymer or large molecule composed of many repeated subunits that bond together, it is the only one that is not composed of carbohydrate (sugar) monomers. Because lignin is a polymer, there are many possible bonding patterns between the individual units, thus, we don’t have full knowledge of all the possibilities. What we do know is lignin contains phenols or hydroxyl groups which are alcohols. As these compounds work together, they produce a preservative action on the food which is antibacterial in nature. The surface of the smoked food is modified with resulting flavors and aromas which are associated with barbecued foods. Let’s take a closer look at these smoke vapor flavors. If you recall our publication on wood-tar creosote we tapped into the science of wood-tar creosote and its purpose as a preservative as well as producer of flavor, color, and aroma to barbecued foods. In that article, we just barely mentioned the compounds responsible for the flavors. 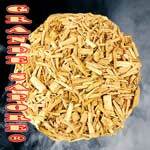 Let’s provide you with the main compound list and what the odor and flavor descriptors are. Phenol: this compound provides the sharp, robust aromas and the astringent, sharp aftertaste to wood fired foods. Dimethylphenol: another compound that has a sharp, robust odor that also has a sweet aromatic undertone. Flavors are sweet, charred, and astringent. Isoeugenol: this is the compound associated with vanilla aromatics in addition to sweet and fruity. Flavor descriptors include sweet, smoked-ham notes, hydrolyzed vegetable protein-like, with clove-like undertones. 4-Methylguaiacol: another compound that includes vanilla-like, fruity, cinnamon-ish, and smoky odors, with flavors of caramel, vanilla, sweet, and pleasant notes. o-Cresol: odors are smoked sausage like with robust, sharp undertones. This one on its own can produce more unpleasant smoky flavors. Guaiacol: Smoky, sharp, aromatic aromas with flavors that are spicy, sharp, sweet and dry. This is the yellowish aromatic oil that forms from creosote. Syringol: Sausage-like aromatic that is sharp and sweet, with a spicy note. These flavors include whiskey notes with smoky-char taste. I’m going to report the lignin levels of common North American hardwoods derived from the Klason lignin method, which values the residue remaining after solubilizing the carbohydrate with strong mineral acid. What follows are percentages of oven-dried woods with temperatures ranging from 68°F/20°C to 248°F/120°C. What do all these percentages mean when it comes to your barbecue? You can assume that the higher numbers mean there are larger numbers of compounds at work to flavor your foods. It’s obvious that woods like hickory and oak have great percentages of phenol, guaiacol, and dimethylphenol, since these woods tend to produce the boldest flavors. Those hardwoods like cherry, alder, and maple have the compounds of methylguaiacol and isoeugenol coming forward in the flavors which results in sweeter and more toned coloring to meats. Another factor that must be kept in mind when examining lignin is the heat level the wood is exposed to. Cook at a higher temperature and these compounds can become muddier as combustion occurs more rapidly producing ash accumulation that can change flavors and aromas quickly. All factor in to the resulting flavor, color and aroma of barbecued foods, whether animal protein, vegetable, fruit, or other. This just further supports that wood-fired cooking is an art that requires a balanced hand that understands the importance of controlling as many factors as possible, primary of which is cooking temperature and airflow to bring out the highest percentage of beneficial compounds the wood can offer. What is your favorite hardwood or mixture of hardwoods to cook with? Leave us a comment to share your views. Bringing you informative recipes, techniques, and the science beyond the fire, smoke, and flavor. 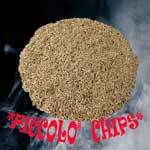 That’s SmokinLicious®! Foodborne illnesses and allergies are common problems that affect many Americans. The CDC estimates that Americans acquire roughly 9.4 million food related illnesses each year, and more than 19 million people were diagnosed with allergies in 2017 alone. Between one and three percent of beef may contain toxic strains of E. coli, which sicken as many as 265,000 Americans each year. Fortunately, the high temperatures involved with smoking meats can help protect your family from E. coli infection. 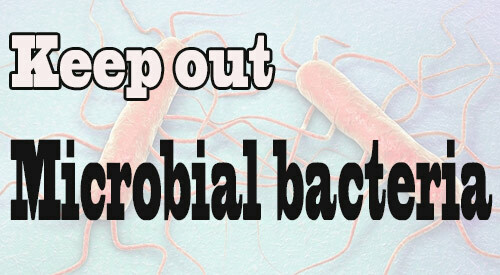 Since the kitchen is a haven for germs and irritants that can make you and your family sick, knowing how to maintain a sanitary environment can make the difference between a healthy family and one who becomes ill frequently. Although mold doesn’t grow quite as readily in the kitchen as it might in the bathroom, without proper attention, your kitchen can become an ideal home for types of mold that could be aggravating or even causing allergies in the younger members of your family. The heat and humidity that is the result of cooking in a kitchen provides an optimum environment for mold. 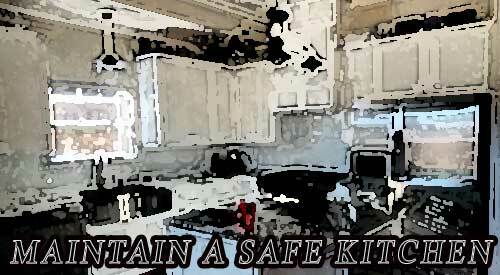 Kitchen sink leaks may also lead to the development of mold if left undetected as well as garbage cans and disposals. Turning on kitchen fans and opening windows in the kitchen and in the whole house will lower the level of humidity in the kitchen while also allowing fresh air to enter. If you live in a humid climate, purchasing a dehumidifier will be the best bet for preventing humidity related mold growth. Checking for leaks regularly, as well as keeping your kitchen environment clean, including the regular sanitation of cupboards and drawers will also help to eliminate mold growth in the kitchen. Another common way that an unclean kitchen can lead to illness is through foodborne illnesses, due to incorrect preparation or spoiled food. Proper handling of foods, particularly raw meat, can prevent your family from making that list. Smoking meat and other delicious foods can have rewarding results, but if food is not handled properly, unfortunate consequences may result. Washing hands for 20 seconds with warm, soapy water both before and after preparing food is the first line of defense against foodborne illness. Washing hands immediately after coming into contact with raw meat, as well as any surfaces the meat might have touched with hot, soapy water will help you have peace of mind that your meal will not make you sick. Proper food handling, like cooking meat to the correct temperature, will allow you to fully enjoy a delicious steak, possibly smoked with hickory chips. Making sure to create a clean and safe environment, free from mold, germs and various contaminants, will allow your family to maintain the high levels of health we all strive for. Be sure to always follow proper food safety guidelines, and check for mold regularly, as not doing so could negatively affect your family. Your BBQ shoes for safety is as important as comfort! 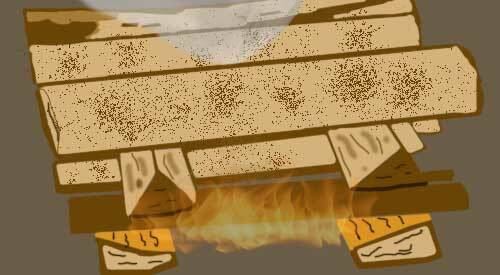 “Wear your shoes!” how to protect your feet around hot embers! I remember a particular year, I believe it was 2007, when my Culinary Events Crew traveled to 29 of the 50 states in the US and 4 provinces of Canada. I felt like I never slept in my own bed and constantly was repacking the suitcase with clothing suitable for the area we would be traveling to. That was the year I lost my favorite lace up/zipper ankle boots to the fire. Not literally burning in a fire but from repeated exposure to hot, stray coals that are common when you engage in wood fired cooking. I was constantly stepping on these stray embers and this consistency lead to me putting more than one hole in my favorite boots. It was a lesson well learned and one I want to pass on to you. Just as your educated that the standard oven mitt won’t cut it when your dealing with excessive heat levels in metal equipment commonly used for wood fired cooking, the same holds true for your footwear. When working around chimney starters that spit and shoot hot sparks of scalding coals and water pans that hold 212°F water, flip flops are not the ideal choice in footwear. Unlike the professional kitchen where Chef’s clogs are the ideal to prevent slips and falls on the constantly wet floors as well as to keep your tootsies comfortable when on your feet 15 hours a day, cooking with fire takes some thought for footwear practicality. That led me to look at options in footwear designed for safety, specifically fire safety. We run a factory operation at SmokinLicious®, which means we have strict policy when it comes to personal protective equipment or PPE. That includes policy on footwear that specifies the need for steel toed footwear. Over the course of a decade, safety footwear has seen a metamorphosis in style, comfort level, and level of protection. Gone are the days of limited color options and welcome the new days of vibrant patterns and even height options on the boot cuff. I was particularly intrigued with a relatively new shoe on the market called the Indestructible® Shoes. Not only are the shoes stylish, but they offer features many other work shoes can’t match. Like the steel toed cap that cannot be penetrated by nails, saw blades, and weight (see the very impressive videos on these tests). With a shockproof midsole, these are also a work shoe that can be worn for hours. But given that we work around a lot of extremely hot fires that emit stray coals, we wanted to ensure that the anti-slip rubber soles would not only protect you from slips but also from the penetrating heat of hot coals and embers. That led us to conduct our own tolerance testing. After firing up the charwood production oven and running a full day of production, we removed hot embers from the oven that had a heat temperature of nearly 1000°F. Our controlled testing included establishing a coal bed within an aluminum foil pan since aluminum is a great medium for radiating heat. We also elected to test the shoe without weight bearing so note that we cannot speak on this parameter, merely the shoes’ outer sole tested on high heat without weighted pressure from a wearer. There were three levels of testing: 30 seconds, 60 seconds, and 90 seconds which in our opinion, simulated the length of time a person would stand stationary at a high fire or cooker. Following each test, the shoe was placed in snow with an ambient temperature of 30°F. We also alternated shoes between tests to ensure no carryover temperature of significance factored in to the stability of each test level. 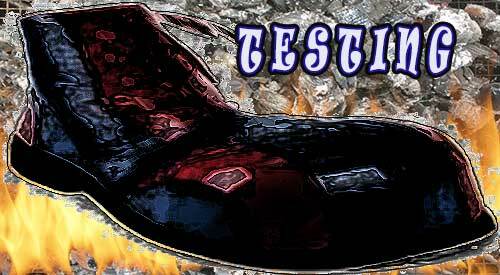 At all three test levels, the Indestructible® Shoes performed brilliantly. Although there is an obvious odor of the heated rubber, it is not considered excessively dangerous. Keep in mind, the thermodynamics of heating rubber results in the rubber shrinking not expanding with heat like other materials. This is due to the molecules of the rubber becoming disordered unlike when they are at a normal temperature which results in the molecules becoming less disordered (i.e. entropy/isothermal). There was minimal discoloration to the lightest coloring of the rubber sole which is a reaction of the rubber’s cells and the carbon in the combusted material. Overall the Indestructible® Shoes proved to be a great option for those who work with live fire and hot coals for cooking. Between the steel-toe and the thick rubber outer sole, as well the shock-proof inner sole, these are an option in footwear for the barbecue and live-fire cooking enthusiast, whether amateur or professional, in protective footwear that is comfortable, long-wearing and fashionable. What is your favorite footwear when you barbecue? Leave us a comment to share your views. Bringing you informative recipes, techniques, and the science beyond the fire, smoke, and flavor. That’s SmokinLicious®! Dr. Smoke- testing BBQ shoes for your safety! This 18th Century Smokehouse reminds us that the art of preserving food with wood is part of our heritage. I had an opportunity to visit an original smokehouse in Hopewell, NJ that is beyond impressive. 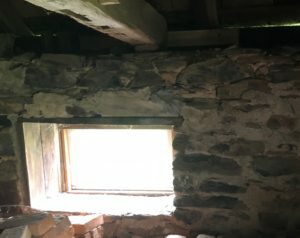 Knowing that this structure likely dates to the late 1700’s, I was most impressed with how the structure maintained itself over the years and how functional it remained. 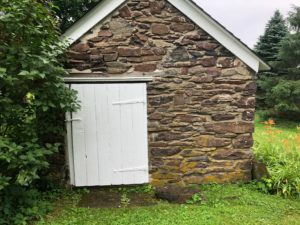 Let me provide a brief history on these fascinating structures as well as share some images of the Hopewell, NJ structure. If you were a farm in New Jersey like many New England states, a smokehouse was a necessity. Pigs were commonly raised during the 17th century and butchered in the month of December in order to be able to slaughter and preserve the meat through use of a smokehouse also called smoak house or meat house. 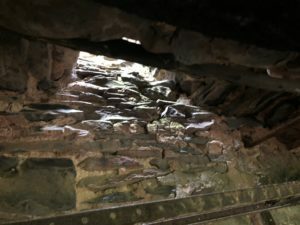 From earliest times, a smokehouse was a small enclosed shelter, where a fire could be kept smoldering for weeks, which slowly released its smoke to the hanging meat that was hung to keep it safe from vermin and thieves. Smoke has long been known to contain compounds that act as preservatives. Phenol and other phenolic compounds in wood smoke are both antioxidants which slow rancidification of animal fats, and antimicrobials, which slow bacterial growth. Antimicrobials in wood smoke include formaldehyde, acetic acid, and other organic acids, which give wood smoke a low pH. Although the process of smoking the meat could take days of preparation, generally the fresh cuts of meat were packed in tubs of coarse salt for about six weeks while the salt drew most of the water from the flesh. Then the salted meats were hung in the smokehouse that contained a small fire which smoldered for one to two weeks. The result was dried, long-lasting, smoke-flavored meat that would age in the same smokehouse for up to two years before being consumed. 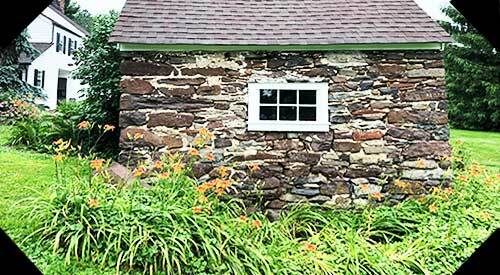 With its original mortar and stone, this Hopewell, NJ smokehouse is a real gem! Estimated to date in the late 1700’s, this was used for both storing and smoking meats, as evidence by the original steel hanging system. You can clearly see the venting chamber which acts as the outtake while circular holes present air intake. These were so well made that despite minor ground shifting, they are still as strong as ever. This structure contains stacks of original bricks which were found in the house and subsequently moved to this location. The house still contains the original, super large stone fireplace that served as the wood fire cooking area and heat generator for the home. 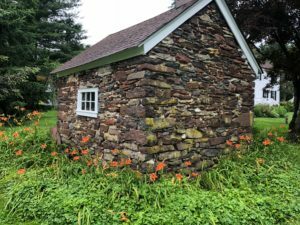 Without question, these early smokehouses are an opportunity to view just what living was like before refrigeration and other luxuries of our current society. I’m constantly keeping me eyes toward the fields and yards of historic areas in search of these hidden gems that started us on our hunger for smoked foods. Is there a historic smokehouse near you? Leave us a comment to share your views. Bringing you informative recipes, techniques, and the science beyond the fire, smoke, and flavor. That’s SmokinLicious®! -Food & Smokehouse Processing Double Standard? 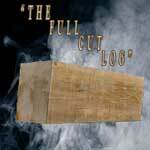 -WOOD SUPPLIER- ARE YOU GETTING WHAT YOU PAID FOR? Dr. Smoke- Great day exploring the history of smoking when there were actual structures! You must be aware of the importance of salt for our body. It is required for the proper functioning of many body functions. But have you ever heard about using Himalayan salt blocks for cooking? Well, this is becoming a trend among those who want to add a wow factor to their cooking. The idea of cooking on these salt blocks is itself very fascinating. But there are more benefits that you can get from these incredible salt blocks as well. Keep on reading to know more about these amazing salt blocks. What Are Himalayan Salt Blocks? 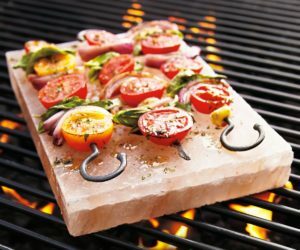 As the name suggests, these are the big Himalayan salt slabs that are hand mined from Khewra salt mines in Pakistan. These are hand carved into different sizes and thickness. Click here to know more about these salt blocks. These salt blocks are made of pink hued Himalayan salt crystals that are locked up in mountains for over 250 million years. This salt is unrefined, unprocessed and free from contaminations. This is to be the purest salt due to the extreme pressure that it has experienced over a long period of time. Himalayan salt provides a number of health related benefits due to which it is being widely used as an alternative to regular table salt. It contains 84 minerals that fulfill our body’s mineral requirement. It is said to be helpful in maintaining the body’s pH level, regulating blood pressure and reducing water retention. So, these Himalayan salt blocks have all the goodness of this salt. These salt blocks are heat resistant and can hold temperature for a long time which makes them really useful. These are good for both high and low temperature and can be used for cooking and chilling the food. 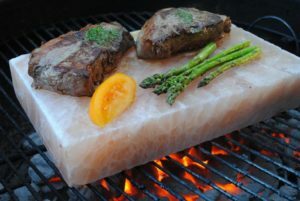 Cooking on a salt block means you are adding flavor along with 84 minerals of Himalayan salt to your food. Salt blocks have moisture retention and low absorbency properties which make them anti-bacterial. Because of this, these blocks are an amazing choice for serving and presenting food. Himalayan salt blocks are so versatile in their usage due to their tendency of temperature. These blocks are hand carved into different sizes so that they can be used for various purposes. 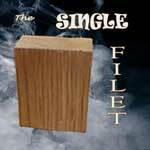 You can cook and grill different kinds of food on these blocks such as meat, vegetables etc. This will make your grilling more fun and exciting. 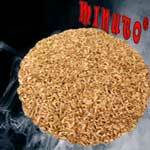 It not only gives a very subtle saltiness to your food but also imparts minerals to the food. 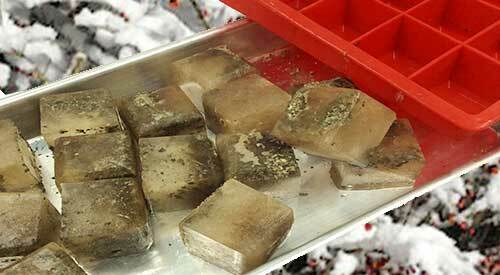 Salt blocks can also be used for curing of some food items such as salmon fish. It will increase the shelf life of the fish. Due to its ability to hold temperature for a long time it can also be used for chilling the food. Another amazing use of this block is to use it for serving a variety of foods. It will make the food more presentable. First of all, you need to choose the salt block that has right size and thickness according to your need. Salt block needs to be tempered before using it for the first time. For this, you need to heat it slowly at a low temperature in an oven, then increase the temperature gradually until you reach 500°C. After that, cool it down to room temperature. This process will improve the cooking surface and strength. If you want to use it for cooking, you always need to pre-heat it. It will make cooking and grilling easy. It is also very easy to maintain and clean a salt block. After using it, cool it down and wipe with any damp cloth. Then let it air dry and store in a cool and dry place. 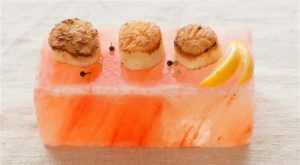 Himalayan salt blocks are not just pretty with their pink hues but also add flavor and nutritional value to the food along with so many other uses. These all natural blocks are a must have cooking tool in any kitchen to add uniqueness and creativity to the cooking. These will not only add to the beauty of your kitchen but also a unique and creative way to cook the food. So, next time if you want to impress your guests, grill and serve food on these blocks. 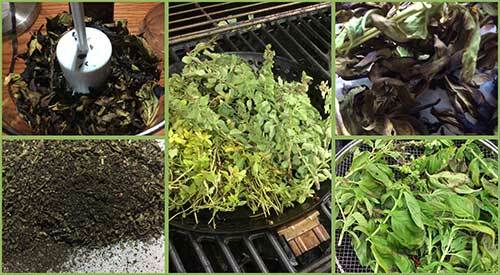 Our Fresh Herbs smoked and Iced ready to bring great flavors to our winter soups! Here’s the perfect way to keep great flavors on hand for when you need them. I’m going to show you how to make smoked herb flavor cubes which consist of our previously smoked fresh herbs and, in my case, bone broth. Whether you smoke all the components of these flavorful cubes or not is up to you. I happen to like the combination of smoked bone broth and smoked herbs for some of my soups, sauces, and glazes. These are the perfect little flavor gems for all your recipes and the prefrozen cubes make adding so simple. Here is all you need to make these flavorful cubes . Silicone ice cube trays, your choice of herbs and spices, as well as broth or stock. It will take about one quart of broth to make 40 flavor cubes. To make portioning the cubes a snap, I use a measuring cup for the liquid. As I previously smoked my herbs and placed them in spice jars, I can portion out the herbs directly from the jars. Today, I’m using smoked parsley and oregano dust for infused broth cubes. These are two of my more popular blends for sauces, soups, and extra flavor to vegetables. Be sure your broth or stock is well strained before adding to the cube trays. Tasting Notes: Don’t forget about fruits as well. These make perfect flavor cubes and can be cold smoked using a handheld food smoker . The best part of making flavor cubes is the freezer does most of the work. I simply place previously smoked herbs of my choice into the bottom of the silicone tray compartments and pour in the broth. I like to put my cube trays on mini sheet pans for easy placement and removal from the freezer. Just be sure to label the trays so when you go to un-mold, everything will be easy to identify. That’s it! How easy is that?? Tasting Notes: You do not have to use silicone cube trays but I prefer these to metal or plastic. I find they don’t taint the flavor of the cubes and they are extremely easy to release. After adding smoked herbs to silicone ice trays and pouring in smoked bone broth, these flavor cubes just take hours of freezer time to set and then they are ready for use. I like to un-mold mine and place in storage bags that allow me to reach in, grab what I need, and reseal the rest. The depth of flavor these little cubes add to soup and sauces, whether for meats and poultry or vegetables, is fabulous. Don’t forget to experiment with a variety of tastes and don’t feel you are restricted to just one herb or spice per cube. 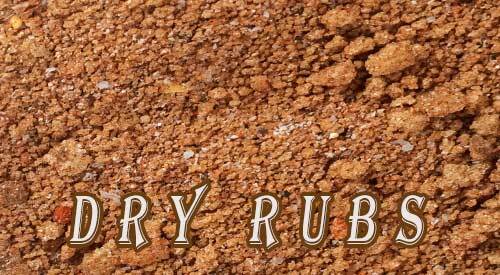 Make flavor blends like Indian flavor cubes with curry, ginger, allspice, and cumin. Or an Italian blend with oregano, basil, marjoram, thyme and rosemary. Or, combine fruit and spices for cocktail-like blends. There are no rules to the combinations you can use so find the flavors you love and flavor cube away! 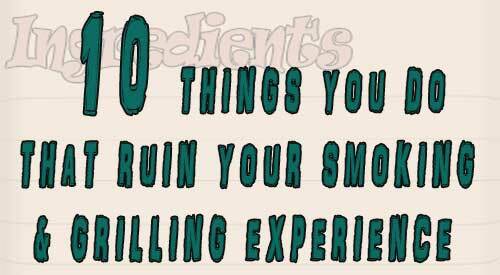 Don’t ruin your Smoking & Grilling Experience by making simple mistakes! We’ve all had those moments when the food comes off the smoker or grill and we wonder, What went wrong?? Sometimes the event is so bad you want to swear off outdoor cooking for good. I’m here to ask you to step away from the ledge and think about whether you do any of the following things. The more items on the list you engage in, the more likely you can benefit from my suggestions. This tends to be the common practice for roasts and steaks/chops. You’ve managed to get a nice crisp skin to the roast or steak and then you let it sit or rest, thinking it will make the outcome juicier. You end up with a soft skin, a wet outside, and waxy fat. These are meat cuts that don’t require resting. In fact, they will rest enough on your dinner plate so they are best served hot of the grill or smoker, without a rest period. You know that charcoal and gas are the fuels used to reach and maintain temperature while you’re cooking, and that hardwood is what flavors your food. You want to ensure there is adequate smoke flavor so you add 10 pieces of wood chunks to the hot coals when you start cooking. Then after the first hour, you add another 6 pieces of wood. STOP! That is way too much and simply put, a waste of a tree. On average it takes just 6 ounces of wood to start flavoring meat. My rule of thumb is to add 3-4 wood pieces for a full chimney of charcoal plus a couple of pounds of unlit. Only when those pieces are fully combusted (black and ashy) do I add a couple more pieces. Depending on what and how long I’m cooking, I may only use 6 pieces total. I know this is one of the biggest controversies out there when it comes to smoking with wood. To soak or not. I take the stand that you should never soak the wood as adding water will only fluctuate your cooking temperature and take more energy away from the fire to steam the water from the wood. Remember, the wood cannot start to combust until the excess water has been vaporized. Work with a wood that has at least 20% moisture for the best flavor. It is well documented that when you want to attract smoke vapor from burning wood, colder temperatures are like a magnet. Don’t take the meat out of the refrigerator until right before you’re ready to place it on the grill. In addition to attracting smoke vapor, colder temperature meats will warm up faster in your equipment than if you left them out on the kitchen counter. This is the one item even well-known restaurants can get wrong. Searing meats before finish cooking does not lock in the juices. What it does do is brown the outside of the meat and firm up the outer surface, giving a distinct pleasant flavor. The meat fibers do not get sealed by this method or produce any additional juiciness to the meat. As marinades tend to contain oil and meat is made up mostly of water, the two tend to compete against each other. Here’s the thing with marinades. Marinating for long periods of time do not allow the marinade to penetrate any deeper than if you marinate for just one hour. In fact, you have an increased risk of breaking down the meat fibers too far with a marinade, producing a soggy outer layer. Stick to short marinade times and understand most of that flavor will penetrate only to the outside layer. Just like meat being made up of mostly water, fat is made up of oil. Again, water and oil don’t mix. Leaving a fat cap on meat only allows it to melt and drip into the equipment you’re using. This can produce some additional flavors to the meat but allow too many drippings into the fire area, and you’ll cause flare ups that will deposit soot onto your meat. Don’t forget, most of us have a habit of trimming fat off meat before we consume it. I’m not sure how many ways I can say this so I’ll be blunt. YOU NEED AN EASY READ DIGITAL THERMOMETER WHEN YOU COOK!! That is the only way to know when various meats and poultry are fully cooked. Follow safe temperature guidelines and don’t go by the color of the meat. Remember, bone marrow reveals itself differently in animal proteins which causes variation in pink, red and even purple coloring near bone. Grill marks are not the mark of a great steak ! A uniform brown coloring on the meat’s surface is what your goal should be. That means a deep sear was achieved and great flavor is hidden underneath. The only way to achieve that is to learn how to direct cook the steak with a higher cooking temperature and frequent turning. This allows for maximum radiant heat and even coloring and cooking. There are all kinds of justifications for why liquids like beer, juice, wine, etc. should be used in a water pan while cooking. It produces better flavor, it penetrates deeper, it produces more moisture. Let me be clear. It’s called a water pan for a reason. It is designed to hold water and hot water at that. By starting with hot water, you allow the energy of the fire to go directly to cooking the meat not heating up the water. Water evaporates which produces a moisture rich environment keeping meats from drying out. Other liquids will not evaporate and could even burn in the pan due to sugar alcohol levels. Even if you’ve checked off a lot of these items as practices your guilty of engaging in, it’s easy to turn around your outdoor grilling and smoking skills. In the end, it will be safer for your guests, better for your meat investments, and an overall more pleasurable experience doing the cooking. Do you have a bad habit you turned around when you grill and smoke? Leave us a comment to let us know. We welcome all types of questions and encourage you to follow and subscribe to our social channels so you don’t miss anything. We look forward to providing you with tips, techniques, recipes, and the science for all things wood-fired cooked. -WHY WON’T MY WOOD CHIPS SMOKE?? 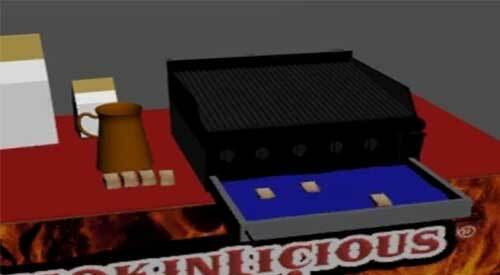 Our animation of Charcoal-Wood Burning Grills and how well SmokinLicious® wood products flavor! For those that have followed us for years, you know we are proud that almost from the start of our Company, we were committed to providing a guide for equipment to cooking wood product match. We refer to our guide affectionately as “Match Your Cooker”. In this article, we are covering our recommendations for charcoal-wood burning grill equipment; these are grills that capable of using charcoal and wood for authentic charcoal grilling. As there are always new equipment lines and models released, our plan is to provide regular updates. We also encourage you to send us a message when you don’t see a manufacturer or model listed. 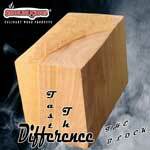 For now, we introduce you to our wood master’s guide to SmokinLicious® cooking woods for specific smokers. We hope you view this guide as a helpful resource for selecting the perfect culinary wood for your equipment. As always, our Wood Guide Team is ready to answer your additional questions and further assist you with the perfect grilling and smoking experience! More Related reading on Charcoal-Wood Burning Grills and other equipment! Dr. 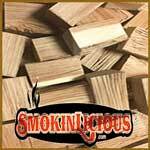 Smoke You have to use Smokinlicious custom products in your Charcoal-Wood Burning Grills! 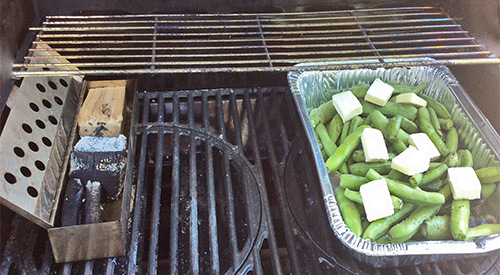 The SmokinLicious® culinary crew’s two-zone cooking method set up to smoke Fava Beans on the Gas grill with Wood chunks! We all know that the key to easy and successful outdoor cooking is to control the temperature. I also believe that outdoor cooking should not hold you hostage at the grill. That’s why everyone should learn the two-zone cooking method for grilling. Let’s cover what type of cooking you can do by this method, why it’s so successful, and how to set up the zones. Two-zone cooking can be done on any type of grill no matter the fuel source. What is two-zone cooking? Using the fuel source on only half the grill while the other half holds the food. Although you may use the unlit side of the grill for most of the cooking, you have the benefit of finishing crispy skins of items or quick cooking thinner cuts of meats on the direct heat side. Two-zone cooking is also called direct and indirect cooking. The indirect side uses indirect convection heat to cook the food which means the heat generated by the lit side radiates into the material of the equipment and produces heat (convection heat) on the unlit side. The direct side produces the heat within the unit and can be used when quick cooking is needed or when a food that has been cooked on the indirect side needs crisping, additional coloring, or some char. 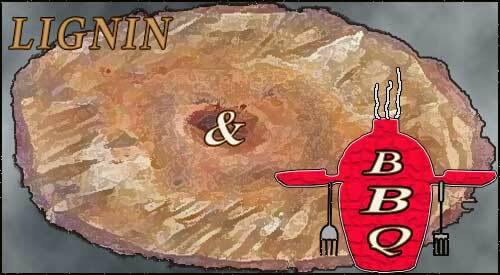 The primary reason you want to set up two-zone cooking is most of the grill cooking does not require direct heat. When you consistently cook foods, especially meats, over direct heat, you easily can have dried, stiff, flavorless results. This is due to the components of meat reacting at different temperatures that with direct cooking occur too fast to react. I will tell you that you need a grilling area that is large enough to establish two zones. I judge the space needed with a rectangular, disposable foil pan. If the pan can fit on half the grill area without issue, then you have plenty of room for a two-zone setup. When using a gas grill, this means lighting the burners on one half of the grill. If you don’t have an even number of burners, then decide how many are to be turned on and how many left off. With a charcoal grill, placing the hot coals on only half the charcoal area. On an electric unit, if you can manipulate the heating element, isolate the element to one side of the unit. The temperature that works ideally for two-zone cooking is 225°F. Of course, I always add wood chunks to give a smoky flavor to the foods. Remember, the hardwood goes on the direct side of the grill or lit burner or hot coals. Note that you can also use a water pan using two zones. This can be placed on either side of the grill depending on when you need the direct heat side. Keep in mind, when doing meats, it’s great to place a pan under the meat with vegetables (onions, potatoes, celery, peppers, etc.) and a small amount of liquid that can collect the meat renderings. You can also place pans of beans to catch those drippings. Anything is fair game. For those times when you don’t want to add any additional foods, you can simply lay a thin foil pan under the grill grate of the indirect side or a sheet of foil. That will collect any fat drippings. Since radiant heat is what you are cooking with when foods are placed on the indirect side, you can cook anything. I love doing tarts and cakes via this method, especially during the hot months when you don’t want to lite your indoor oven. In fact, those are the times that I cook an entire meal using a two-zone setup. You can also cook multiple items using both direct and indirect heat. A long cooking meat goes on the indirect side, is cooked to temperature and held there, while a side dish is cooked on direct heat. Don’t forget, if the cookware you use is high heat tolerant, you can use cookware as well. This is how I can make cakes, tarts, and bread on the grill. You need to view this equipment like an oven as that is essentially what it is! I’m going, to be honest. Although it’s true that you can produce more moist foods using a two-zone method the real reason I love this method of cooking is I can walk away from the grill. This is particularly true when using a gas grill which holds the temperature steady, which for me, is 250°F for long cook meats and regular baking temperatures for all my cookies, cakes, tarts, bread. Remember, charcoal grills will still require you to refuel so the temperature can fluctuate more if you’re not careful. Keeping an extra chimney starter of charcoal going will solve that issue. As a final note, even though two-zone cooking allows you more time away from the grill, you still need a good digital thermometer to monitor the temperature of the food. Invest in an easy read one and you’ll really enjoy this new way of grilling and smoking. -WOOD ROASTED ONIONS TO DIE FOR! Dr. Smoke- The two-zone cooking method on the gas grill is a great time saver for the busy Chef trying to prepare other parts of the meal menu!